DUMBARTON'S recent run of good form came to a sudden end in the Boxing Day clash at home to Ladbrokes Championship third-place Livingston. On a bitterly cold afternoon Sons started brightly, but then crashed to a 4-1 defeat. They went in front on 25 minutes with a superbly taken goal. The move involved a terrific ball to Ally Roy from Stuart Carswell over the Livi defence, and an equally good finish. Then things started to go wrong. Two minutes after the opener a mix-up at the back let Livingston captain Craig Halkett fire a loose ball into the net for the equaliser. Tom Walsh had a chance to put Dumbarton ahead again on the half hour, but shot over the bar. Just before half-time Livingston took the lead, when another error allowed Shaun Byrne in to finish clinically for 2-1. There were two changes for Sons at the break, with Christian Nade and Dimitrios Froxylias coming on for Calum Gallagher and Chris Johnston. But on 58 minutes Livi's Rafa De Vita burst down the right and cut back to Dylan Mackin for a simple but decisive third goal. The game was put firmly to bed on 78 minutes when Scott Robinson drove the ball through the defence for 4-1 after Sons failed to clear their lines. 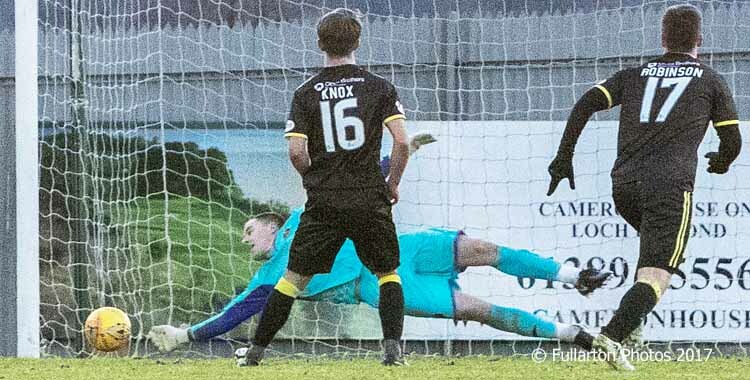 Keeper Scott Gallacher spared Dumbarton further embarrassment with a great save (pictured), diving to his right to prevent Matthew Knox adding a fifth goal from the penalty spot seven minutes from time. However, the pain was increased by other means when Kyle Hutton was sent off for a second yellow card in two minutes right at the end. The only consolation for Sons was a late substitute appearance by Danny Handling, returned after a long injury gap.